John Carpenter Lambert was born (24 Aug 1824) and raised in Pilot Knob (Pilot Mountain), Surry County, North Carolina. Not far from and in the same county as Mt. Airy – the home of actor Andy Griffith. He married Elizabeth Worrell from neighboring Carroll County, Virginia. The couple later migrated to Kentucky, and then on to Carlyle, Clinton County, Illinois. 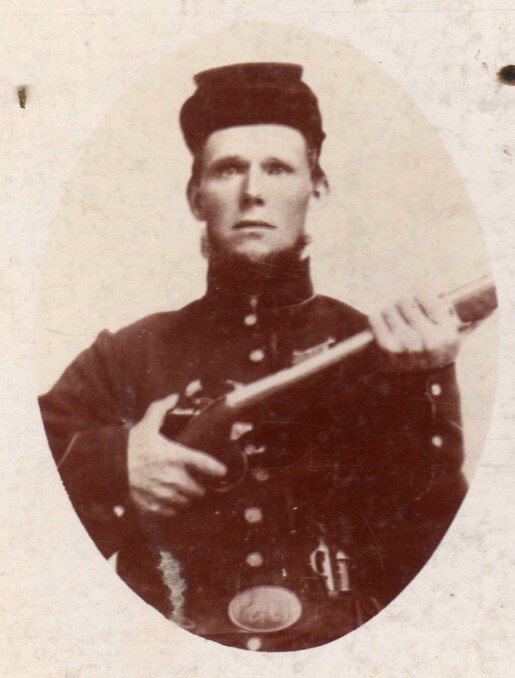 John mustered into the 62nd Illinois Volunteer Infantry, Company G on 10 April 1862. He later reenlisted as a Veteran on 30 March 1864. The Sixty-second Infantry Illinois Volunteers was organized at Camp Dubois, Anna, Ill., April 10, 1862, by Colonel James M. True. April 22, 1862, ordered to Cairo, Ill. May 7 to Paducah. June 7, to Columbus; and thence in Colonel Ditzler's Brigade to Tenn., where it was stationed on the Mobile and Ohio Railroad near Crockett Station, with headquarters at Kenton. December 2, 1862, moved to Jackson, Tenn., and thence, to Grand Junction and Holly Springs. 13th, at midnight, started for Jackson, leaving about 200 men sick and on duty at Holly Springs. About two miles from Jackson, found the railroad bridge on fire. Marched to Jackson, and four miles beyond, skirmishing with the enemy. 20th, followed Forrest 20 miles, and 21st, returned to Jackson. 23d, marched to Mendon Station, Denmark, and Toon's Station, on Mississippi Central Railroad, and returned to Jackson 27th. December 20, Van Dorn captured Holly Springs, paroling 170 men of the Sixty-second, including the Major and 3 Lieutenants, and destroying all the records, papers and camp equipage of the Regiment. The Regiment moved from Jackson, in Colonel M. K. Lawler's Brigade, December 31, 1862, in pursuit of Forrest, and reached Tennessee River, opposite Clifton, January 3, 1863; but finding the enemy well posted on the opposite bank, with heavy artillery, returned to Jackson, January 8. On the 18th of April, 1863, the Regiment was brigaded with Fiftieth Indiana, Twenty-seventh Iowa, and First West Tennessee, in Second Brigade, Third Division, Sixteenth Army Corps, Colonel James M. True commanding Brigade. On the 18th, moved to Lagrange. June 8, First West Tennessee was taken out of the Brigade, and Forty-ninth Illinois and Vaughn's Battery, Illinois Light Artillery, assigned in its place. August 19, ordered to Memphis, and 34th, embarked for Helena, and, on the 28th, took up the line of march for Little Rock. September 2, overtook General Steele's Army at Brownsville, and, on the 10th, met the enemy, near Little Rock, driving him back, and compelling the evacuation of the place. January 9, 1864, the Regiment re-enlisted, as a veteran organization. April 25, moved to Pine Bluff, where it remained until August 12, 1864. August 12, started to Illinois, for veteran furlough. After the expiration of the veteran furlough, returned to Pine Bluff, arriving November 25, 1864. The non-veterans of the Regiment were ordered to Illinois, for muster-out. April 10, 1865, the remaining veterans and recruits were consolidated into seven companies, and remained on duty at Pine Bluff, until July 28, 1865, when it moved, by river, to Fort Gibson, Cherokee Nation, where it was stationed as a part of Brigadier General Bussey's command, in the District of the Frontier. Mustered out at Little Rock, Ark., March 6, 1866, and ordered to Springfield, Ill., for final pay and discharge. Regiment lost during service 3 Enlisted men killed and mortally wounded and 9 Officers and 251 Enlisted men by disease. Total 263. After the war, the family migrated to the Oakland, California area, where they resided for the rest of their lives. He did a little farming, and primarily was a hunter for markets. John was a member of the Lyon GAR Post No. 8, in Oakland. He lived until 07 April 1913 where he passed away at the Veterans Home in Berkeley, California. John Carpenter Lambert is the Great-Great Grandfather of SVDC & CC David Smith, through his paternal Grandmother. 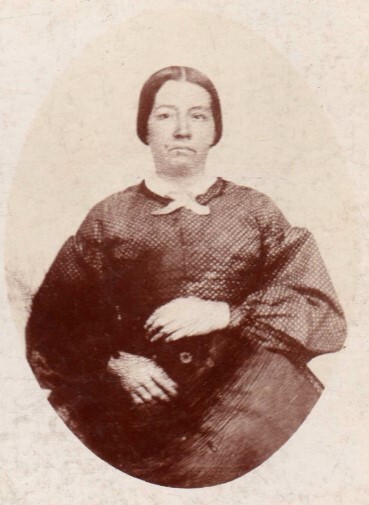 Elizabeth Worrell Lambert, wife of John Carpenter Lambert. Note of Interest: Elizabeth’s Uncles and Cousins were in the Confederate Army in various Virginia and North Carolina regiments. Her father John Anderson Worrell was a soldier in a Kentucky regiment during the Mexican War where he passed away at Palo Alto, TX. Her Grandfather and a Great-Grandfather fought for the Patriot side in the American Revolution.